Today (October 25), there are several hundred people walking around Toronto with their hearing compromised because they went to Ben Frost's show at the Garrison last night (October 24). Frost was loud, just as he should be, and he gave the audience the all-consuming experience they were hoping for. Playing songs from his recent album, A U R O R A, he performed standing over a table full of synths and sound modulators with a live percussionist at the rear of the stage. While A U R O R A is in many ways a pared down album, without the guitars, piano and other instruments on his previous efforts, last night he achieved a sound as massive as anything he has put out, demonstrating that minimalism is about using a single sound to its full potential, rather than simply being quiet. Songs like "Nolan" and "Flex" took on a new life in the live setting, reaching way beyond the sonic limitations of recorded formats and appearing in their full glory. A producer's real instrument is the studio, and last night, Frost wasn't a producer — he was a performer thinking bigger than tape. The stage was illuminated by flashing white lights for most of the show, reflecting off of the heavy smoke that surrounded the performers. It was a minimalistic visual approach that complemented Frost's performance perfectly, looking variously like a lightning storm and supernova, as if it was expanding and contracting with the mood of the songs. Frost cancelled his show in Montreal earlier this week at the last minute because the venue couldn't provide adequate bass speakers. It was a move that angered a lot of fans, but it couldn't have happened any other way. A Ben Frost show without the full range of nuances in his music is not a Ben Frost snow; for Frost, the art is in the small details and not the final effect. 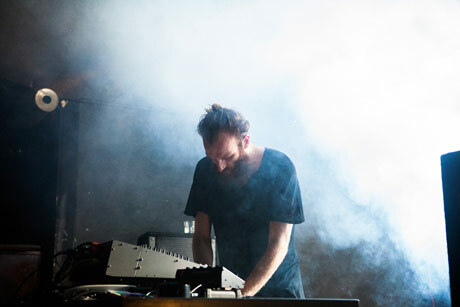 On a more visceral level, you're not at a Ben Frost show unless you can feel the bass in your whole body. Frost showed last night that his perfectionism works on all levels, not just an intellectual one, and that his music punches you in the gut as much as it demonstrates new avenues in sound engineering. It was a thrilling performance, all the more so because it featured a restless artist who is always in flux and whose finished product is an experimental process. Sharing in that process is the real appeal of his performances.